Stay in a lovely house in a perfect location within a five minute stroll of Coachford Village and close to some of the very best angling on Inniscarra Lake. All bedrooms are ensuite with power showers and terms include a full breakfast. There are bait facilities, tackle storage and information about fishing locations in the area. Your hosts John and Siobhan Hogan own the Village Inn on the main street. 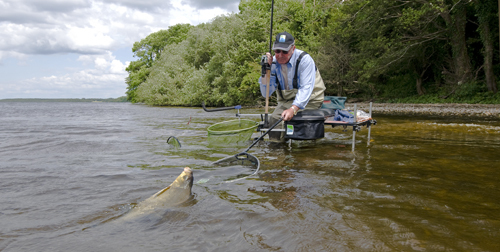 Catch return on Inniscarra Lake during 2011 have been brilliant and in one June session three anglers caught over 1000lb of big hybrids! There are two massive lakes created by the Electricity Supply Board with many accessible sections along its 25 miles of bankside. Inniscarra Lake forms an integral part of the River Lee system and offers the coarse angler excellent fishing in beautiful settings and outstanding fishing for bream, rudd, roach, carp, tench, pike and perch. productive stretch of the River Lee – known for its bream and hybrids – only two minutes from the front door. John has a great knowledge of where and when to fish and is the organiser of one of the angling festivals.